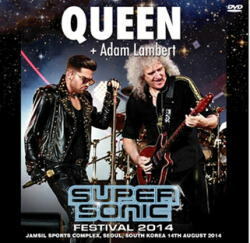 Comments: The first 'Queen' concert in South Korea. This time with Adam Lambert on vocal. Some copies of this 2cd comes with a BONUS dvdr, by Wardour label. Same show. There are 3 bonus track. Not sure where bonus track are filmed. 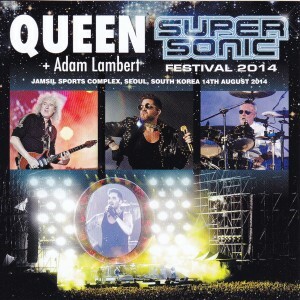 August 14, 2014, was held in Japan performances before, and complete recording of an ultra-high-quality audience recording of the best level the stage of Queen + Adam Lambert stood on the stage of Super Sonic in Seoul, Korea. It is Korea’s first performances of Queen memorable, but as a feature of this board, it is a good thing is sound anyway. And has released a high-quality title of the North American tour from Wardour label until now, but the sound of the best performances in Seoul this board is no doubt. Cheers also have been recorded largely in its own way, but it is an acceptable range, more than anything, is the musical tone are in the direct firmly up here the first time definitely. Moreover, despite the stage at the festival the same format as the Japanese, and a full set which is not the same as North American tour most of the more than 2 hours playing time. The Show Must Go On has ended up being omitted like Japan, but the play I Was Born To Love You’s first tour instead. To say that I listen to where this song has received large like Japan, that there is also popular in Korea or you will know. By the envy anyway that is willing to play a full set, there is also time constraints in Japan, or was just Osaka, Who Wants To Live Forever and Somebody To Love is In The Lap Of The Gods … Revisited but it is not was or not listen only in Tokyo alone, but on you are playing them all, Dragon Attack parent-child drum battle of Roger, the popular (Adam Miser the entering of the song), and long guitar solos of Brian in Seoul, and Tie Your Mother Down without a large upsurge mistake also shows off and do it. Adam will tilt the audience as “! ‘S show for the first time of the Queen” in front of the Somebody To Love. The greeting in Korean of several Love Of My Life before, Brian has been a great deal of delight fans to the mood and friendly. Brian paraphrased as “We will rock in Korea” also ending cry as “Seoul Korea!” At the climax before it enters the second of the song, we say thank you in Korean even after the show in ’39. Tie Your Mother Down that did not play in Japan and he showed off his dialogue with the audience of the same “All Your Love Tonight” and North America. 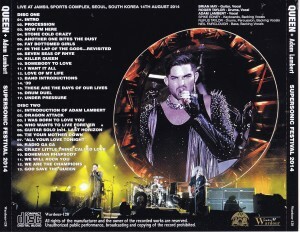 Adam lip service “I wonderful than American fans” to South Korea a big fan of climax. Seemed blessed with the weather, it was stage contents of enviable to fans in Japan, but it sounds this good, full set show representing Asia tour anyway, was recorded in neighboring countries and Korea, you may want to say good luck and also for our fans in Japan. Sound is good very originally, but we are getting better and better show progresses, it has been recorded in sound amazing enough it seems to be the highest peak as a boot leg of the Queen of the past, such as the second half in particular. Including tape part of the opera of the middle, this much is enough not to be heard once, the Bohemian Rhapsody good sound. 2-Disc title of large recommendation to enjoy the sound of the best of the best live. It is determined from the release Wardour label limited pressing CD.